Ever have those chocolate oranges at Christmas time? It doesn't seem like it should work, but chocolate/orange is an excellent flavor combination. Case in point: The Chocolate Orange. This product from Trader Joe's is a little light on the chocolate end of the equation, especially for dark and milk chocolate lovers, but it's kinda the same idea. These cookies taste a bit more like "candied oranges." They've got real citrus flavor, and they're super sweet. 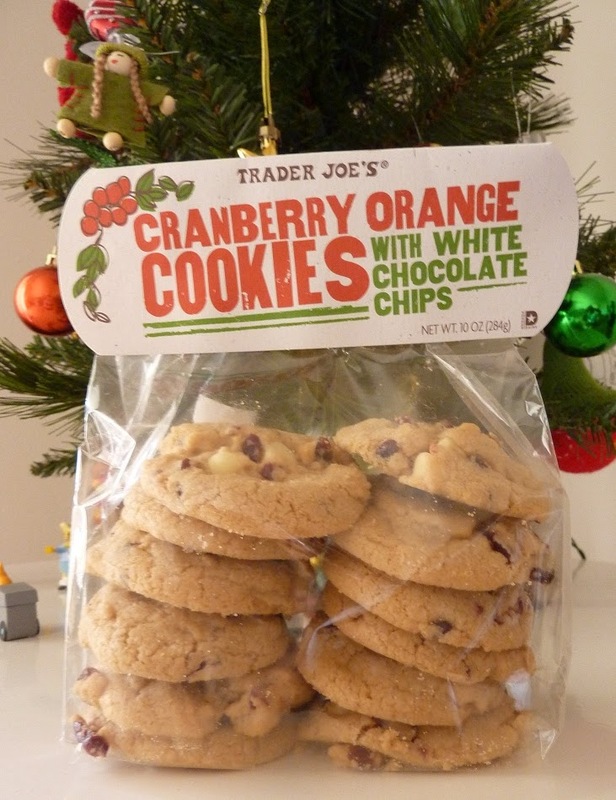 The dominant flavor in these cookies is definitely the orange. Sonia agrees. She's not fond of citrusy cookies, but I am. 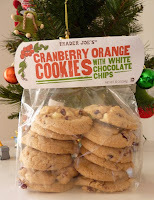 TJ's has done the citrus cookie thing before, and they did it pretty well. In this product, the cranberries add a bit of tartness, but you don't really taste cranberry per se. Likewise, the white chocolate adds sweetness, but you're not really tasting chocolate. You're tasting a cookified, extra-tart, extra-sweet orange. And I think it's brilliant. My wife, on the other hand, wasn't as pleased with the overwhelming citrus flavor. She likes the cranberry part of the cookies, but wishes it were more prevalent. She likes the white chocolate (although, I know from experience that she'd be at least as happy with dark or milk chocolate). And we both loved the soft, bready, cookie part of the product. Sonia pointed out that they're vaguely reminiscent of Subway's birthday berry or white chocolate raspberry cookies...with way more citrusiness. The overall texture is sorta like a sugar cookie, in that it's a bit buttery and delicate. While Sonia couldn't bring herself to give them higher than 3 stars, I was tempted to give them a perfect score. If I had tasted the cranberry and white chocolate just a tad more, I think I would have. 4.5 stars from me. Bottom line 7.5 out of 10.